By the late 1930s the UK had a huge confectionery industry making all manner of confections from simple boiled sweets to fancy chocolate specialities. 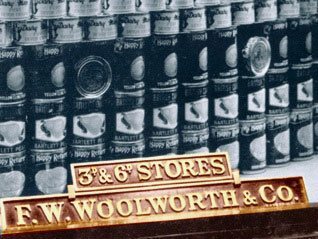 Woolworth had become the country's dominant outlet for the ranges, and had held prices down by playing one supplier off against another. In 1939 the stores continued to offer a half pound slab of chocolate (227g) for sixpence, just as they had when the doors first opened thirty years earlier. But everything was about to change. It was little wonder that most of the factories supplying the stores were close to the docks, principally in the East End of London, the Mersey estuary and the outskirts of Bristol. All converted raw materials from abroad like sugar and cocoa into finished products for the shops. The outbreak of War not only interrupted the supply lines, but saw pressures to use the mass production capabilities for munitions and, before long, saw the dockside locations facing enemy bombardment from the skies. As a new decade dawned, Britain stood alone against the Axis powers. The counters at Woolworth's were running on empty. Prices were rocketing for whatever supplies remained available. Behind the scenes the Buyer had to think laterally to maintain a credible offer. This page explores the steps taken by the Government and the Company both to spread the stock fairly, and to find sugar substitutes to satiate Britain's appetite for something sweet. 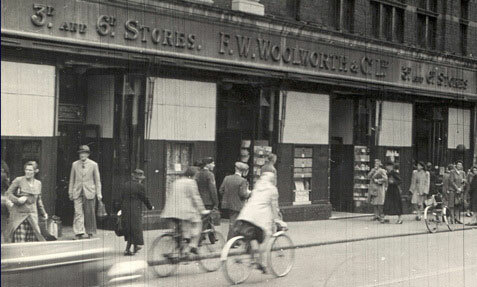 By the late 1930s the F. W. Woolworth Threepenny and Sixpenny Stores enjoyed a dominant confectionery market share. They seemed unassailable. 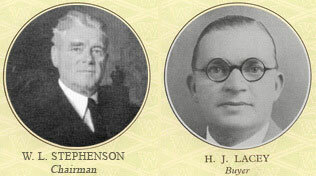 1939 saw the opening of the 750th shop. The firm still had a postbag full of recommendations for new towns. Rival retailers found the prices hard to beat, especially as the firm had steadily built its ranges of confectionery to stimulate impulse purchases as customers called to buy from the staple ranges of homewares, toiletries and gardening. The have-a-go culture had encouraged the Buyers to broaden the offer. 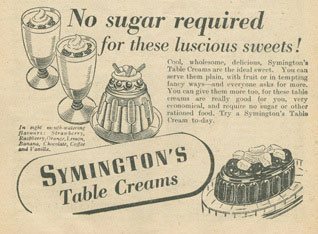 For example the sweet department had been extended to include tinned fruit, cream to go with it, and, to complete the picnic, tinned tuna fish! The food ranges consisted virtually entirely of special opportunity buys - but stores could always be relied on for tinned peaches and cream as an alternative to pic'n'mix sweets. A sinister reason lay behind the high sales for the tinned goods. The diplomatic situation in Europe had prompted re-armament and war preparations. Gas mask drills had frightened the public and had encouraged 'canny' shoppers to squirrel away tinned foods in their kitchen cupboards as an insurance against future shortages. Their foresight would later provide birthday teas and wedding gifts in troubled times. By Christmas 1939 stocks were low, as many factories were requisitioned for war work. The automation required to wrap and pack sweets proved useful for munitions and military suppliers. But, despite the shortages, initially only three food groups, sugar, bacon and ham, were rationed. Within days of the outbreak of War, the Woolworth Chairman, William Stephenson, was called to serve the nation in an unusual way. Ministers called on the supremo to head Aircraft Production for the Air Ministry, bringing his expertise in mass production to the task of making components and assembling enough Spitfires to repel an expected attack from Nazi Germany. The role gave him a hotline to the heart of Gonvernment. Stephenson and his Food Buyer Bill Lacey used the new access to persuade the powers-that-be not to ration ice-cream, biscuits and chocolate. In exchange stocks would be reserved for the stores in the towns and cities facing the worst bombardment. It was hoped that the initiative, and a similar venture for patriotic comics and jigsaw puzzles, would be good for morale on the Home Front. Lacey experimented with new food products that were nourishing and could be produced cheaply. Symingtons Powdered Soups and Table Cremes (blancmanges using artificial sweeteners) were hurried to the shelves and offered for sixpence with the marketing slogan 'just add water', long before the advent of cup-a-soups. He also obtained large quantites of tinned whale meat and snook as substitutes for the tuna fish, salmon chunks and pork luncheon meat of earlier times. Customers remember that these tasted of rubber and were somehow 'wrong', even after the recommended overnight soak in vinegar to "bring out the flavour". Despite this, they proved more acceptable than the horse meat offered elsewhere. Despite the decision to ration the sales of sugar in January 1940, that summer Cadbury's advertised teatime biscuit assortments, noting they were available in 'all Woolworth stores'. Sweet rationing was introduced in 1942. The new rules gave an allowance of seven ounces (200 grams) to everyone over five years old. Several customers and employees of the era have told us of the unofficial redistribution of rations in-store. Many adults, particularly old age pensioners, handed in their coupons "for the little ones" so that children would never be turned away from the sweet counters. The 200g ration was enough to allow the children just a couple of sweets each day, but only if they could find them. Coupons were no guarantee of product availability. By Christmas 1942, the District Managers' Christmas Messages in the Staff Magazine note that sweets were in short supply in all areas of the country, and that any delivery was eagerly anticipated. When goods arrived word soon spread around the town, prompting a long queue of youngsters at the pic'n'mix counter. 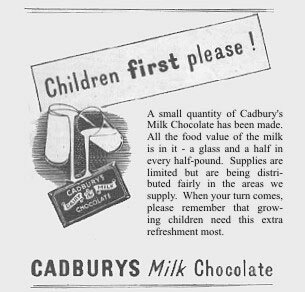 These shortages were reflected in Cadbury's advertising. 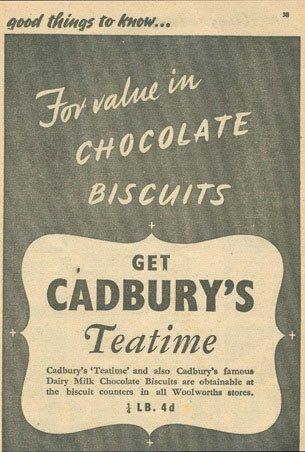 Three years after boasting that biscuits were available in all Woolworth stores, Cadbury placed advertisements in the popular Picture Post magazine, asking people to save the chocolate for children, who needed its nutrition the most, when limited stock became available again. Woolworth's role in sharing out the ration, and finding a little extra for children, served to grow the sense of community. It served to enhance the strong emotional bond between shoppers and the brand that endured throughout the chain's time in the High Street. In Jersey and Guernsey invading German soldiers were surprised to find chocolate on sale at Woolworth's, months after supplies had run out in their shops at home. Colleagues remember that the soldiers respectfully joined the back of the queue and waited their turn, paying in pennies and saying a polite 'zank you very much'. By 1942 coupons had become part of the British way of life and a key part of the store routine. Scissors and little scraps of paper - and the secret stack of spares for children and deserving causes under the counter - became a feature at more than 20,000 cash registers in 767 stores! Everyone expected that Victory would bring an end to rationing. But, as our 1950s Gallery reveals, rations were cut and supplies remained limited well into the 1950s, as an export drive sought to drive down the national debt. The restrictions finally came to an end in 1953, when it seemed the whole nation joined the queue at the Woolworth's pic'n'mix!